Hey everyone, I know it's been silent here at the Terlum Team, but rest assured that we have been making lots of progress the last few months! A new version of both the client and server is nearing completion, and a first beta will replace the current version in a few weeks time. So, you ask, what's new? I'll tell you what's new! 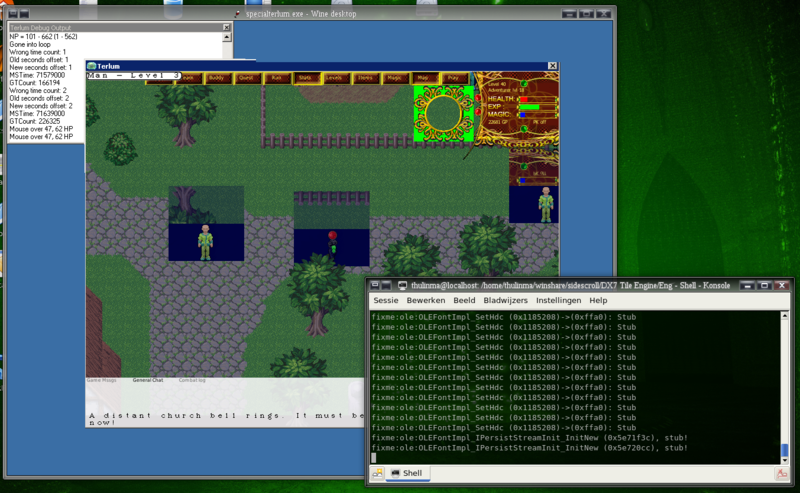 - Both the client and server have been completely recoded in C++ (previously VB6 and RealBasic, respectively) - meaning that not only the framerates you'll be getting are over tenfold of what they used to be, but also that the game is now compatible with all main operating systems (Windows, Linux, Mac) instead of just Windows. - The client was completely redesigned in the process of recoding it, and is faster, better, and supports more features than any previous version. - Did I mention the interface is completely skinable? We will be featuring the best skins created by players on the website, as well as providing a default skin and small tutorial about skinning. - Cheating will be absolutely impossible - in the rare event that someone does figure out a way to cheat the system, we will be able to reverse all actions that player took, making sure nobody is affected by it. This ensures a fair game for everyone. 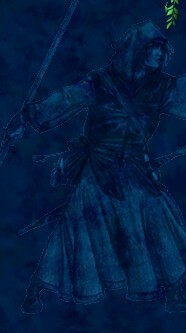 - Not only the land will change, but also enemies appear and disappear depending on actions taken in the world. If, for example, strong players tend to hang out in a certain area, strong enemies will start appearing there after a while too, making sure they have a challenge. Enemies can also migrate to different areas if they are hunted and/or become extinct. The same applies to almost every aspect of the game. - Of course we didn't forget the storyline! We have been working on quite an awesome story, if I do say so myself. The first few chapters will be appearing in-game shortly after the first public beta is available. Speaking of being beta, we are quite sick of it, really. As soon as humanly possible we will be changing that "beta" status to "released" status. This means more players, no more resets of stats, and generally more fun. Once the beta is public, I will be posting updates on the website about progress twice a week. I know it has been silent for nearly a year here and I want to thank everyone that is still following progress for staying with us. Exciting times are ahead, and all you testers will be receiving something special in your accounts when we go to release state, as a small thank you. I personally can't wait to see everyone in the new game when it will be released. Stay tuned for more information, I will be posting here as soon as the new beta goes public! I know everyone is eager to see the next version, with so many new features coming in it! It's not quite done yet however, and still needs a few weeks of coding/testing before it's ready to release in the wild. Does Terlum work in Linux? EDIT: Our beta testers have been notified of a new test version, to test this new big feature. If you are a beta tester and I forgot you, simply contact me for the required information! - Character recoloring has been recoded in C++, resulting in faster loading times and no more (noticeable) slowdown when a player comes online. - Fast character recoloring has been made available for 16 and 24 bits graphics modes as well, resulting in an even bigger speed boost in those modes, now bringing them up to par with 32 bits. Please note that playing Terlum in anything lower than 24 bits is not recommended however, due to the very ugly display of characters in 16 bits mode. - The bug which resulted in "laggy" player movement has been fixed. - Some improvements in Vista compatibility, upping the frame rate somewhat. - New button to change your password after logging in. - New buttons to delete characters from your account. - In the create new character screen, right-clicking now cycles colors backwards and left-clicking cycles colors forwards. There are actually more spells, these are only up to level 33, and spells up to level 47 have been written so far. It was however thought unfair to give magicians that many spells before the other races get all theirs. Besides, humans are still missing all spells, and that will be the next update. Here is the long anticipated beta-update. Please note, this update is a BETA BUILD! This means it is NOT supposed to be finished yet. will make sure your old one remains save. Everything was tested and SHOULD work, but no guarantees, sorry. important) changes to the communication protocol. So, beta testers, please start reporting bugs as soon as possible, and all other players, enjoy your luck and the new features! can be exploited for personal gain, make sure to notify me (Thulinma) personally. Don't forget to read the changelog! Especially the beta tester info. - XP Sharing: You no longer get XP for the killing blow, but only for the % of damage you did to a NPC. makes all those effects possible on NPCs. - NPCs can now be cursed/poisoned/buffed/etc again, with the same ones players can get cursed/poisoned/buffed/etc with. agression of that NPC, but not the stats or abilities. - Added combat log chat tab. - Some less-important game messages will now no longer pop up big in the screen. - Added damage kind "chaos" (adding to "friendly" and "unfriendly") for attacks that hit both friendly and unfriendly. - Spell range has been increased from 2 squares vertical to 3 squares vertical. - All TerScript scripts can now also be executed on NPCs. - Speech balloons can now be 2X wider than before. - Optimized a lot of old code to be faster. - Added support for percentile scipts. - Area Of Effect damage and Duffs are now improved and supported, respectively. - Spell list now has icons in stead of names. - Spells can now be learned by leveling up. - All helper-NPC code has been rewritten and perfected. - Helper-NPCs can now be adjusted in level. - Spells can now be learned by in-game events (like quests, shops, etc). - Spell list now only contains learned spells. - Magic spells can now have individual mana settings. - Magic spells can now be autolearned. - Player resistances to the above types have been added. - Attacks can no longer do more damage than the victim has HP left. - NPC resistances to the above types have been added. - NPC attacks now have damage types. - NPCs now have individual races. - NPCs now have individual stats. - NPCs now have individual stat bonuses. - NPCs now have individual attack/spell lists, with timings. - NPCs now have tactical information about the spells they can use, making them formidable opponents. - Fixed some small NPC fighting behaviour issues. - Some minor NPC display problems were fixed. - Added support for coating your armour with poisons and/or curses. Also for NPCs. - Skills can now be executed from spells (and other scripts). - Horizontal Micropathfindng has been added to NPCs: they can now find their way around small obstacles. houses and other small openings. - Hit animation for non-melee damage has been added. - Hit animation for Poison has been added. - Hit animations have been slowed to 50% of the original speed. - Hit animations have been limited to 30 in stead of the previous 10. - Hit animation code has been sped up and made compatible with multiple animations. - Fixed a bug causing some incantations to be un-cancelable. - The Thug Salesman in Laku has been made cheaper. - The Thug Salesman in Laku has been fixed. - npc.gyn (83kb) and says.gyn (30kb) were merged into npcdata.gyn (16kb). - magic.gyn was reformatted, and now takes a mere 7kb in stead of 600kb. - duffs.gyn was reformatted, and now takes over 5X less space than before, yet holding more data. - Healing items (food and potions) have been increased in power. - Never, ever, ever teach a bunny a blasting spell. They become scary. Seriously, don't. - Never, ever, ever teach a bunny a healing spell either. Same reason. - Test everything in this release. So much was changed, nearly everything could be broken by the changes. - Don't forget to test the tutorial, creating a character, etc. - No need to test the pre-game-GUI, nothing was changed there. - Player houses code will probably be rewritten at some point in the future... so no need to test that thouroughly yet. - Clan battles and castles have not been debugged at all. Expect crashes. Same for random dungeons. if possible, more is better. on players first. Please supply balance information if you can! - Magicians and Humans have no spells right now, they will be added in a small update soon. - Uncertain: Are items in-drop-able in player houses? Note: Anything may be added to, or removed from this list at any time. - Anything indicated by a "?" is probably going to be removed soon. - Anything indicated by "(V2)" is planned for either Terlum 1.2 or the members version. - Anything indicated by "(M)" is planned for the members version. To use this site and the game, you must agree to the Terms & Conditions and the Game Rules.